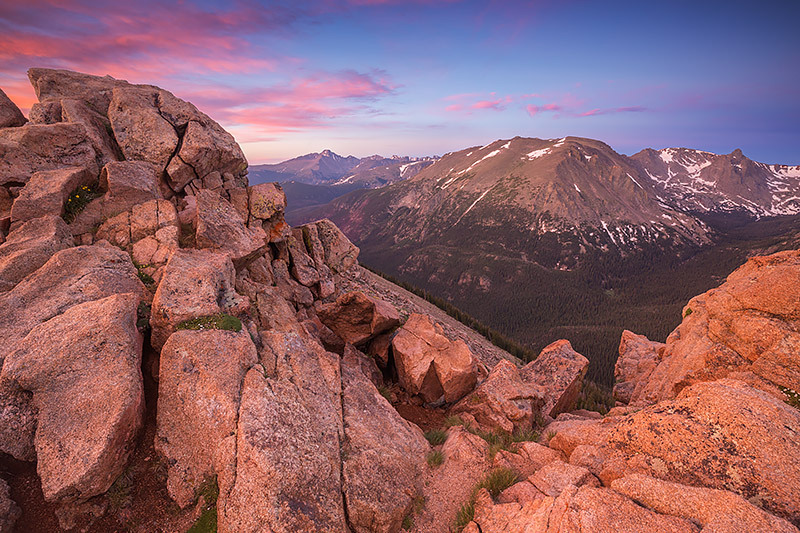 Sunrise unfolds over the east side of Rocky Mountain National Park from Trail Ridge Road. Colorful clouds drift over Forest Canyon and Stones Peak and the Hayden Gorge. In the distance Longs Peak rises over the plains of Colorado like a sentinel standing watch over the park. On this calm morning above treeline the winds are calm and the air still, only the occasional protest from a marmot can be heard echoing through the rocks and boulders on the tundra. Photo © copyright by Thomas Mangan.